The Anne Frank House is in Amsterdan near the Prinsengracht canal. The museum is dedicated to Anne Frank, the young girl and famous diarist that hid in a secret annex in the house. The museum also focuses on other forms of discrimination and persecution. This museum opened in the 1960’s. The house that the Frank family stayed in has been there since the seventeenth century. Otto Frank, the head of the family, had his office in the annex. The Franks were not the only ones hiding in the house. The Van Pels family and Mr. Fritz Pfeffer also hid with them. There was a bookcase which could be moved that had been specifically designed for this purpose. The annex itself is rather small. Moving the bookshelf leads to three doors, one has narrow stairs leading to it that almost look like a ladder. The washroom is small with one toilet and one sink. Everyone in the house had an allotted time to go into the washroom, but they are not able to flush the toilet during the day very often since someone below may hear. Documents and objects belonging to every person that hid in the annex are displayed here. The Secret Annex itself does not have any furniture, since it was all taken away when they were betrayed and arrested. The people from the office helped the people in the secret annex. They would gather food for them. The building right next to the office in which they worked was at 265 Prinsengracht. This building was recently renovated. The museum gives visitors information about the diary and how significant it is. There are a few things that are permanently on display in this part of the building, including Anne Frank’s original diary and other documents. The front part of the house, which faces the canal, has been renovated to have the same atmosphere and style that it would have had in Anne’s time. This was done so visitors would feel emotionally and personally involved in what happened as soon as they visited the house. The story of Anne Frank is told using her diary as a reference, quotes lifted straight from the pages. There are many other original possessions on display including photographs and documents. These often give accounts of hiding and deportation in concentration camps. Although the Anne Frank House is a world-famous museum right now, the building came very close to being demolished. The Nazis ransacked the place after they had arrested the people hiding in it. It was common practice to confiscate everything from a hiding space. The only thing to be saved from the Annex was Anne’s diary. Otto Frank was the only person that lived in the Annex to survive until the war had ended. When it did, he went back to Amsterdam and was sheltered by the helpers, who had all survived the war, while he looked for his family. He went back to the Annex to find it bare and empty. He started up his business again, but the house was as dilapidated as the rest of the houses on the street. Commercial buyers were in talks to purchase it so that they would be able to demolish it and create some newer facilities. The building was eventually sold to a company that left it deserted and crumbling. By the time it was saved, Anne Frank’s diary had become a massive worldwide phenomenon. A group of intellectuals and scientists founded the Anne Frank Foundation in 1957 with the goal of opening the house to the public and to promote Anne’s ideals. 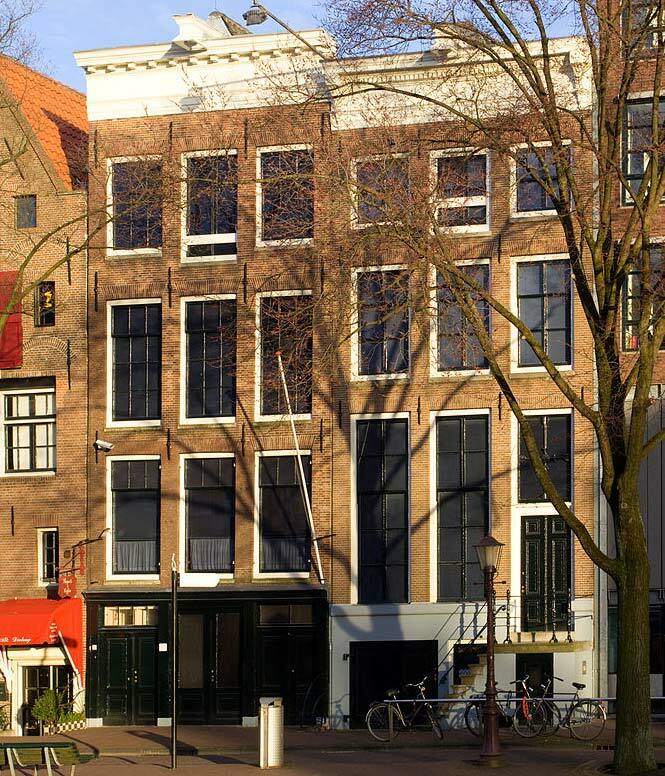 Prinsengracht 263, the address of where the house stands, was opened to the public on May 3rd, 1960 and has since become one of the most visited museums in the world. Great care has been taken to ensure that the secret annex remains in its original condition, but the museum has undergone many renovations over the years to be able to better accommodate and inform guests.